If as a 5-year-old you were told about concepts of impaired judgment and fairness, you’d have most certainly not understood a word and forgotten all about it seconds later. But the story of Birbal cooking his kichdi at an unreasonable height from the fire to teach Emperor Akbar a lesson in fairness and making him see his own impaired judgment has stayed with all of us for decades. That’s the beauty of storytelling. When parents and teachers tell stories to young kids – be it traditional children’s stories or ones from their textbooks or even tales woven around the goings on of everyday life – it serves as a launch pad for turning them into fluent readers. It also helps in instilling a love for language, the ability to appreciate the beauty of the written word and recognize the power of communication. How do children learn their mother tongue or native language? By hearing people around them speak, and just like that, within the first three or four years of life, they are able to form grammatically correct, meaningful sentences and have complete conversations in their native language. Most students grapple with building a similar grip of a foreign language, such as English in our case, because our teaching methods are too focussed on grammar, sentence structures, vocabulary. Telling one story a day in the language you want a child to learn can prove more effective than years of classroom lessons put together. You can notice a marked improvement in a child’s knowledge, vocabulary and comfort to converse in a new language within a month of following this exercise. As mentioned before, stories have a way of staying in our memory for a long time. 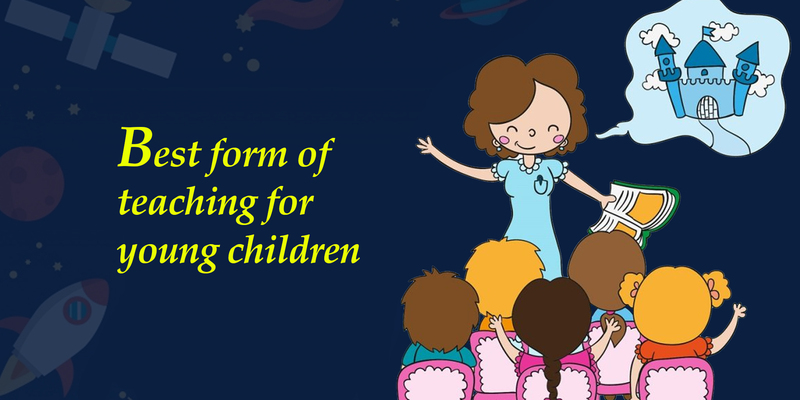 When you are telling a story verbally, children do not have any pictorial representations or images to fall back on. This makes them concentrate harder on the details of a story in order to remember plot points and characters. And thus, storytelling can be used as a powerful tool for boosting memory. The effectiveness of this technique can be enhanced further by incorporating questions, during and after a storytelling session, to hone memory skills, especially among preschool and primary classes. When a child listens to a story without any visual aid, they have to rely on their imagination to make the plot come alive in their mind. For example, if a story involves birds sitting on a tree, the child uses their creativity to imagine the tree and bird you are talking about. Asking the kids to make a pictorial illustration of the different sub plots of a story is a great way to further fan their creative thinking abilities. Apart from the tried and tested method of telling stories verbally, audio books can prove to be a helpful tool for using storytelling as an exercise for building creativity and imagination in young kids. The utility of storytelling isn’t limited to languages alone. As students progress to higher classes and are introduced to a whole new spectrum of subjects, the storytelling approach to teaching can be tapped into when introducing new concepts and topics. From science to history and even mathematics, stories can be used to enhance students’ understanding of just about any subject. Teachers and parents can source ready-made stories from the internet to fit a particular topic or subject. Stories have a way of exciting the mind, and thus, can prove to be a valuable educational technique masquerading as a fun activity.